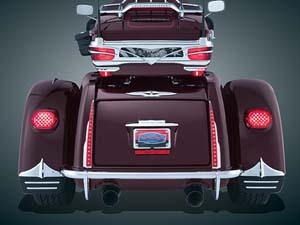 Sculptured housings w/run, turn & brake lighting, Body & Fender Accessories! 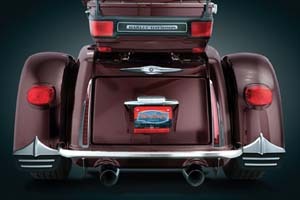 7274: Add a little chrome to the side of your trike and dress up the trunk area! 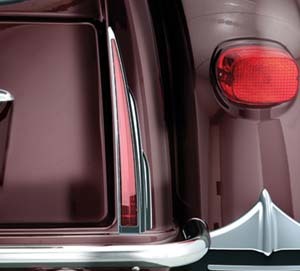 Designed to compliment both the trunk and the wheel arch, these Side Body Accents are easy to install using high-strength 3M VHB. 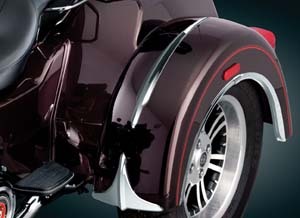 Fitment Details: Harley '11 to current FLHTCUTG Tri-Glide Ultra Classics & '11 FLHXXX Street Glide Trikes. FB-50: Black Classic Fender Bra. 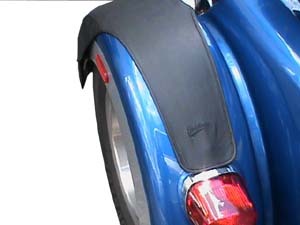 Universal Trike Fitment, Fits Most Trikes - Harley, Motor Trike, Lehman, , Champion, Hannigan, etc., Made in USA. This measures 8.5 wide by 11 inches tall. 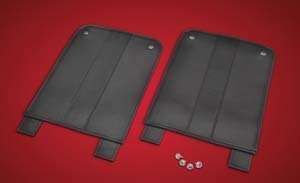 Mounted by using either Hook and Loop or by utilizing screw snaps. 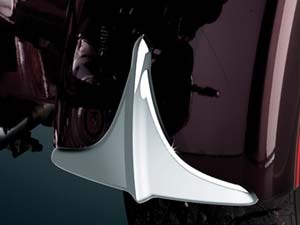 SF-15: Bra set feature a SaddleHyde top with a soft under liner that prevents road debris and your passenger′s boots from damaging the fender paint. Smooth surface. SF-14: Same as above but with embroidered black tattoo flame design. 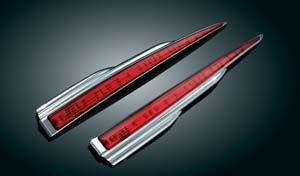 FR-130: Built with high luster chrome plated steel tube. 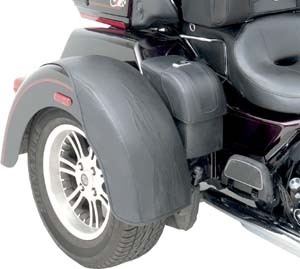 The Trike Fender Racks designed for the Trike and are easily installed with the supplied hardware. 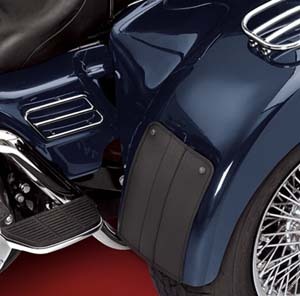 Rack size: 12” L x 6-1/4” W.
7214: Much more than just chrome edging, these two-piece fender flares add three dimensional depth to an otherwise bland wheel opening on stock H-D Trikes. 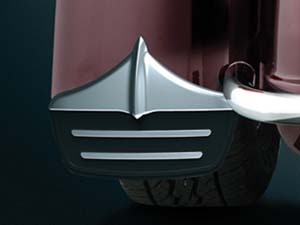 With unique lines & a brilliant chrome finish, these rear fender flares are sure to turn heads. Installation is quick & easy using 3M VHB. 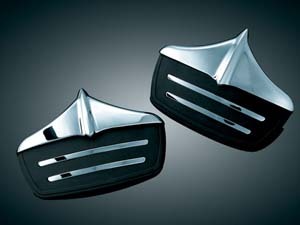 7215: Designed with the rider in mind, this new accent adds a burst of style & a bit of paint protection to an otherwise plain area surrounding the trunk latch/lock push-button. Made from lightweight yet durable chrome plated ABS & install in just minutes. 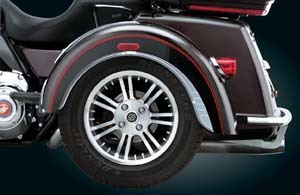 7216: Enhance the look & add some character to the top side of your trikes rear fenders with these unique & noticeable accents. 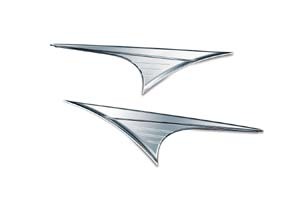 Made from lightweight, durable ABS & chrome plated for an unmistakable look. 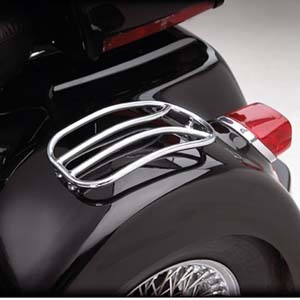 7217: Add some chrome & protect the edge of your Trike’s fenders with these stylized accents. 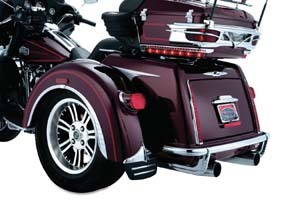 Mounting to the front leading edge of the rear fenders, these chrome plated ABS accents are just what you need to dress up a very noticeable area. 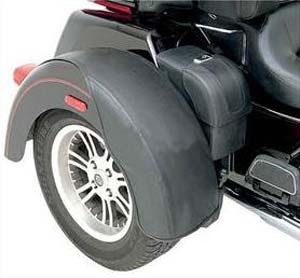 7220: Reduce road spray from the rear tires & add some style to your trike with these great looking mud flaps. 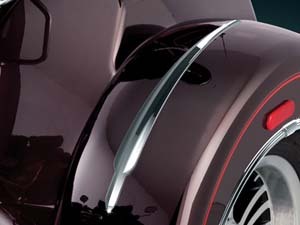 Made from durable, yet flexible rubber contrasting with chrome trim to match the lines of the rear fenders. 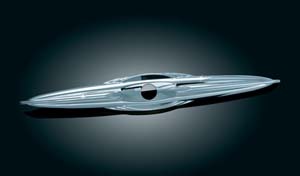 Secure, bolt on design installs quick to get you on the road in no time. 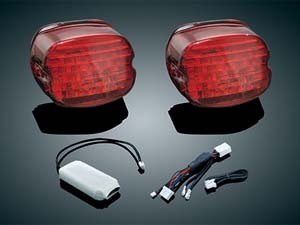 6976: Rear Light Bars blend sculpted chrome housings with auxiliary L.E.D Run, Turn, & Brake lighting. Easy to install with pre-applied 3M VHB adhesive tape & plug-&-play wiring. 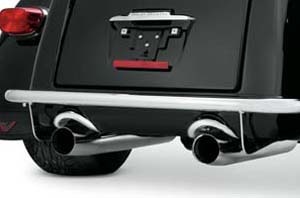 HD-43: This chrome-plated accent piece trims the exhaust openings in the trunk fascia, and adds a touch of brightwork to the rear of the bike. Easy to install with no visible fasteners. 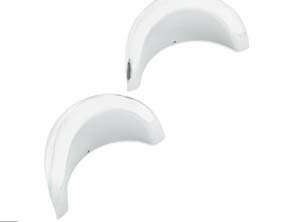 Formed steel trim features pre-applied high-temp adhesive backing for a clean, uncluttered look. Special Order item.